In Singapore, astonishing change happens so quickly that buildings are erected and renovated before you can finish your next bowl of curry. Traveling from neighborhood to neighborhood, there is little evidence to Singapore’s past. Through a somewhat tiring maze of malls, schools and brightly painted, uniform apartment buildings, Singapore’s fascination lies in its astonishing ability to change. Massive topographic reconstruction projects have even altered the landscape, turning hills into reservoirs and ocean into extended coastline. As the sterility of modern improvement travels from block to block, Singapore’s culture is still undeniably rich. Chinatown, Arab Street, and Little India infuse the contemporary infrastructure with spices, smells and color. In each neighborhood hawker center, all you have to do is order a plate of noodles and dumplings to realize that culture is stronger than the concrete. Food history and culture, is an indestructible aspect of identity and topic of pride for Singaporeans. Singapore’s position at the southern tip of the Malay Peninsula, has made it one of the busiest ports in the world, infusing the country with the flavors of surrounding countries. Malaysian, Chinese, Indonesian, Indian, Thai, Vietnamese and even British influences have made Singapore a gastronome’s delight. 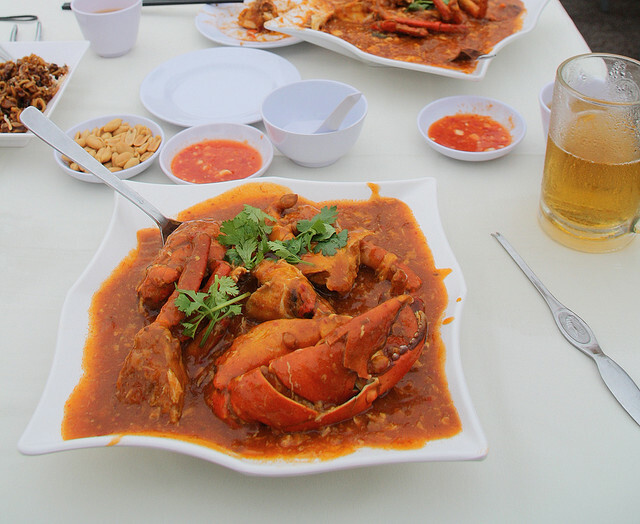 With the cheapest and often the most delicious food, hawker centers showcase the region’s fusion of cultures through traditional dishes – chilli crab, chicken rice, fish head curry, roti prata (flat bread), dim sum (mini dishes), hand-pulled noodles, etc. 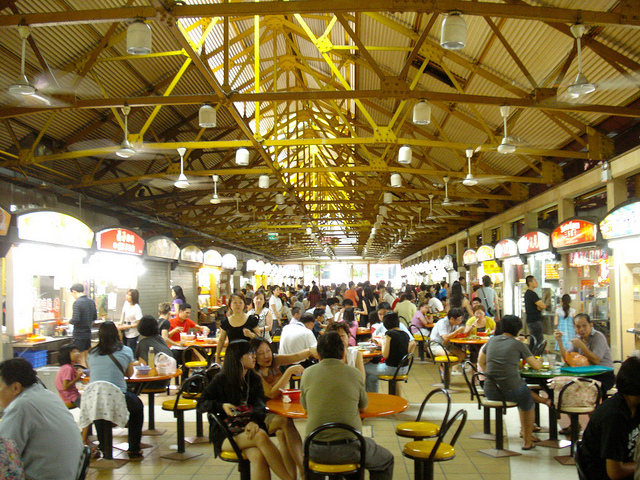 Hawker Centers are essentially, the “food courts” of modern Singapore. And once you learn to navigate them, the taste of Singapore is at your fingertips. Most of the menus have pictures and numbers, which is enormously helpful. Using some combination of speaking, saying numbers and pointing usually gets the job done. Generally, items are ordered and received at the counter, while a comrade can scout out a place to sit. Drinks, on the other hand, are ordered tableside and Tiger is the county’s beer of choice. For those who are a little less adventurous, the next best place to try authentic Singaporean cuisine is the Strait’s Kitchen buffet at the Hyatt Hotel. While some diners might turn their noses up at the idea of a buffet, this is no second rate dining experience. Debuting in 2004, Strait’s Kitchen is a buffet unlike any other. Divided into Peranakan, Indian, Malay, and Chinese stations, it is a one-stop shopping trip to try all of the local specialties from Hainanese chicken rice, a simple, but flavorful dish of steamed or boiled chicken with stock-infused “oily rice,” to laksa, a spicy coconut curry soup with rice noodles. Each dumpling is filled with a hot broth, and the dough is so delicate and thin that when picked up with chop-sticks the boa sags, revealing its filling through the almost translucent skin. 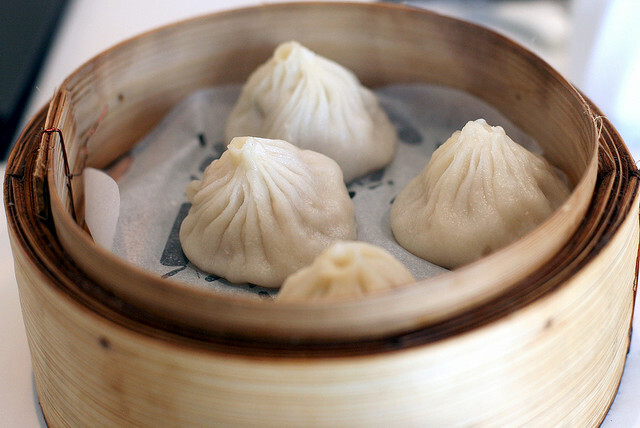 Excellent Xiao Long Bao can be found all over the island, but three restaurants stand out among the rest — Imperial Treasure Restaurant, Paradise Dynasty and Din Tai Fung. While Din Tai Fung is a Taiwanese based chain, its presence dominates the Singaporean food scene and can be found at numerous locations from Sentosa to the Marina Bay Sands. Paradise Dynasty, on the other hand, is based in Singapore and should also be noted for its unforgettable Peking duck. Paradise Dynasty has taken the bao a step further, offering eight creative varieties of the classical Chinese dumpling ““original, ginseng, foie gras, black truffle, crab roe, cheese, garlic and Szechwan. 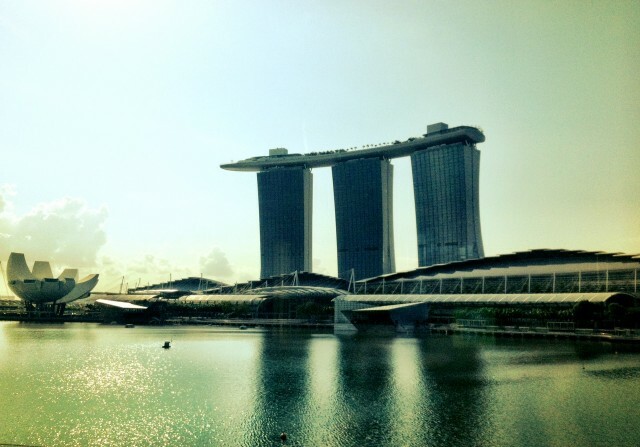 At the very top of Singaporean dining is Sky on 57. Singaporean born, Chef Justin Quek has developed a modern, “Franco Asia” cuisine that appeals to both western and eastern palates. Quek uses French techniques to execute Singaporean flavors. His powerful menu with dishes such as, Maine lobster with Asian black pepper sauce, or baked miso cod with lime and ginger butter, showcases the possibilities of successful food fusion and pays tribute to Singapore’s dynamic flavors. While at first glance, Singapore may seem “savory-centric,” Singaporeans do have a sweet tooth. All over the island, hundreds of teens sip milk tea through straws, bouncing their teeth on large, black tapioca pearls. Known as “Bubble Tea,” it can be found at every mall and is a great after-school sugar-loaded snack. If you like the tapioca pearls, try Bubble tea’s more flamboyant cousin, Cendol. It is a cacophony of textures involving delightfully disturbing bright-green mung bean-worm noodles, coconut milk, palm sugar, and shaved ice. But don’t be fooled– while shaved ice is a component, this is no snow cone. And once you’ve passed Cendol 101, travel to the Rasapura Masters food court at the Marina Bay Sands, where you can try variations of cendol containing red beans, corn, candied palm kernels, sago pearls, and grass jelly. Food, more than historic monuments and museums, has become one of Singapore’s most important aspects of tourism and also, cultural identity. Good quality food is available everywhere you look in Singapore ““- at every hawker center and mall people gather and eat foods rich with flavor and history. The more I explore and the more I eat, the more mystified and charmed I am by Singapore’s food culture, which has persisted through so much change. The hawker center, unfamiliar ingredients, and exotic produce only give a taste of what the country has to offer. *For another dose of cultural food experiences, check out our articles on Spanish ventas and the seafood of El Hierro. I have never been to Singapore and I actually want to come there and have a holiday with my husband.. For sure he will definitely love it.. Thanks for this awesome post..